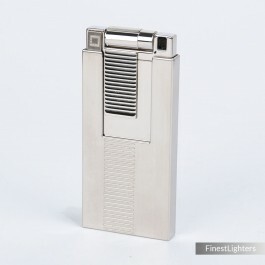 This lighter is part of the S.T.Dupont D-Light collection, a line of innovative high-end lighters produced from 2004 to 2006. Very thin and light (only 7mm x 85 grams), it is opened with a sliding movement, and closed by means of a spring loaded retraction button. This is the High Tech model, finished in brushed palladium (platinum).